Ucluelet and Tofino were blessed with not just one, but two incredibly regions for sea kayaking in the Pacific Rim: Barkley Sound is tucked in right next to Ucluelet, while Clayoquot Sound is on the Tofino side. Not only is each place incredibly scenic, both are notorious for being fantastic places to kayak at any level. Ucluelet and Tofino each possess a number of guided kayaking companies available to show guests the ropes and help them explore the incredible areas. Between the Broken Group and Deer Group Islands, located in Barkley Sound, over 100 islands are available to explore. Most are located a bit farther away from Ucluelet than what would be enjoyable to paddle, so visitors to the area usually indulge in a taxi to the Sound. 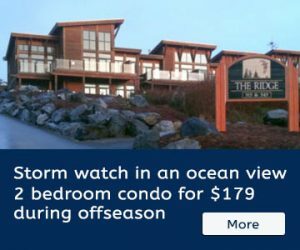 Alternatively, guests can also launch from Toquart Bay, the main launch point outside of Ucluelet. With so much to explore, many opt for a mutli-day excursion and there are 8 Parks Canada operated campsites in the Broken Group available to stay at. Make sure you take a GPS with you, fog can often set in. Make sure you are prepared for the weather – this means packing properly waterproofed rain gear. July and August are the driest months, but “fog rain,” very thick mist, sometimes sets in. May, June and September has less precipitation on average but it is still possible to have a week straight of rain mixed in with sunny and cloudy days. When sticking to the outside of the coast or on the Island near the coast, the kayaking is considered moderate to difficult. Paddling against the current or in big swells increases the level of difficulty. Kayaks can be rented in Ucluelet from a couple different outfitters. 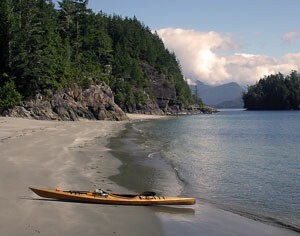 Kayaking in the Clayoquot Sound includes Meares Island and numerous other sandy beaches scattered throughout various islands and islets. As a bonus, there are also a number of fantastic hikes that can be reached by boat, such as the Big Tree Trail on Meares Island that showcases some of the largest trees around. Also on Meares is the infamous Lone Cone Trail, which has a reputation for being gruelling, yet worth the stunning view at the top. 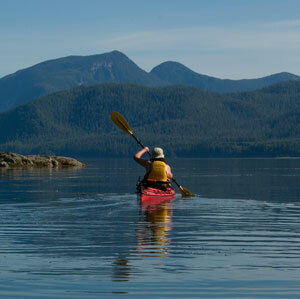 Kayaking in the Clayoquot Sound can be done on your own or with a guided group if you are new to kayaking. Be sure you ask a guide about tidal currents and waves if you do head out alone, however, as the Sound is a diverse area. While Clayoquot is typically quite protected, traveling between islands or on a particularly windy day can be challenging. Paddling through the harbour can be a bit hectic, as Tofino sees a lot of traffic, especially during the summer months. Be sure to paddle close to shore and be aware of what’s going on around you. Once further into the sound, the traffic should slow down. Take a GPS with you in case the fog sets in . Make sure you take appropriate rain gear. July and August are the driest months, but “fog rain” often sets in. May, June and September has less precipitation on average but a week of cloud and sun or a week of rain can be of equal probability. You can rent sea kayaks in Ucluelet right at the launching point or get a taxi into Clayoquot Sound. There are also a number of outfitters in Tofino.